Because we eat a lot of hummus here, we are always looking for something crunchy to go with it. There are plenty of tasty chips and crackers on the market, but they all contain a fair amount of sodium. 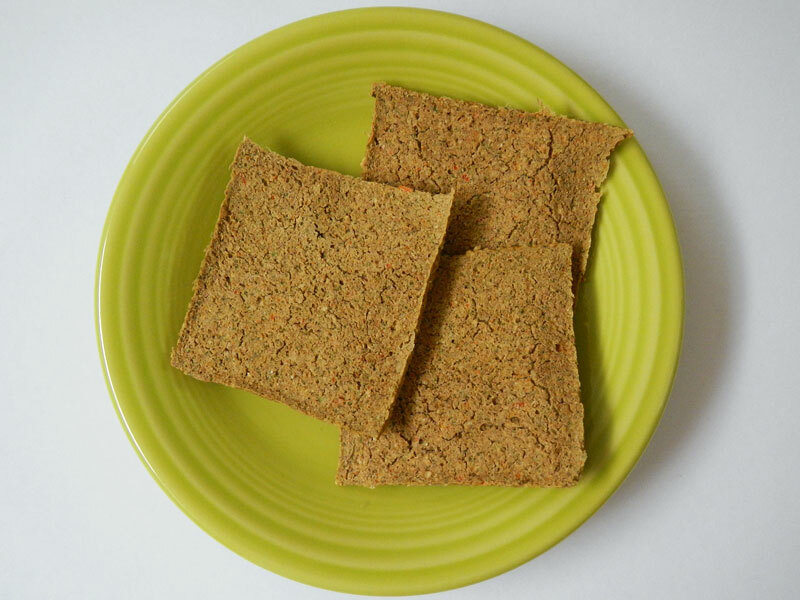 So my goal was to attempt making crackers in my dehydrator. Put the buckwheat in the food processor and pulse a few times. Add the beans and pulse a few times, scraping the bowl in between. Add the nuts, seeds and flax and pulse a few times, scraping the bowl in between. Add everything else and continue pulsing and scraping the bowl until everything is well incorporated and you are happy with the texture. You can add more of the bean cooking liquid if the mixture is crumbly. It should be a fairly dry paste. Spreadable, sticking together, but not runny. Spread mixture on ParaFlexx sheet on a dehydrator rack. I scored mine to make 16 crackers. Dehydrate for 2 hours at 145 degrees. Flip crackers onto mesh grid and continue dehydrating at 125 degrees for another two hours. Note: When using a dehydrator, times vary. The length of time is determined by how much ambient humidity is in the air and how much moisture is in the food you put in it. Since I made one full sheet and a little bit on a second, the above time is how long mine took. If you make several trays at one time, adjust the time accordingly. This was my first attempt at making crackers. I did have a bit of a problem getting it spread evenly on the sheets, so a few of my crackers were a bit thin in the middle. I think next time, I will make individual crackers and see how that works out. We thought the texture of these was good, but they were slightly crumbly. I think if I make them just a little bit thicker that problem would be solved. I was really surprised while they were drying. The house smelled like Flamous Brands Falafel Chips! These are one of our favorites, but we have to drive a fair distance to get them because none of the stores near us carry them. I must have hit a similar spice combination. They didn’t taste quite the same as the falafel chips, but they were good. They also have a little burn or tickle at the back of the throat. That means that we prefer to eat them with something and not by themselves. Next time I might try using a pepper medley rather than straight black pepper. We found we couldn’t dip into the hummus with them because they broke too easily, but we could spread it on top and then eat it. Over all, I will make these again!